Vitality Chiropractic provides a warm, friendly environment where you can enjoy the benefits of pain relief and maintain your improved state of health. We strive to help you change and optimise your functional capacity to enjoy life. We do this by providing you with the information about your health status so that you can regain control over your body. Vitality Chiropractic aims to empower you to make the long-term changes towards a more rewarding lifestyle. We encourage you to assume an active role in your individualised treatment plan based on your functional needs. Many conditions affect the way you feel and move. We can relieve the pain and restore mobility which is often compromised by injuries or long-term conditions experienced by athletes, the sedentary and those with mobility restrictions. Treatment is equally suitable for newborns, children, during pregnancy and seniors. Chiropractors are experts in treating conditions involving the bones, muscles and joints of the entire body, from the neck to the shoulders and hands, all the way down your spine to your hips, knees and feet. "Head, shoulders, knees and toes" should really be our song! It's all about improving your quality of life and helping you to take back control over your body. We can also come and visit you at your workplace to provide a talk on posture and back awareness. Back pain causes countless days sick leave and in many cases, with proper training the injuries can be avoided or significantly reduced. Vitality Chiropractic provides a drug-free, non-surgical healthcare approach to maximise your body’s natural ability to heal. Utilising neurological and orthopaedic tests, you will receive a careful and thorough examination of the muscles, bones, joints and nerve supply that support your body. We will agree a treatment plan with you and treat you with a variety of techniques tailored to your particular needs. In the short-term, we will treat your symptoms and provide pain relief. For a more long-term solution Vitality Chiropractic aims to address the root of your problem by developing a preventative plan of action. Having seen the immense relief that chiropractic treatment gave her family (from baby to granddad), Shelley embarked on a 5 year Masters degree, graduating with Merit. 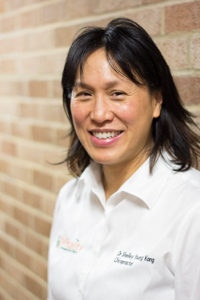 Shelley is passionate about helping and educating a broad range of people to understand how chiropractic techniques can empower and benefit their everyday life.